The Timex Expedition E-Altimeter combines a classic appearance with precision functions. 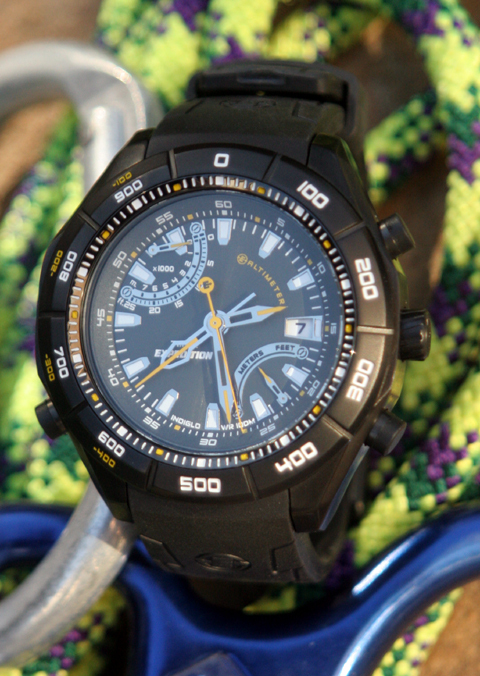 The Timex Expedition E-Altimeter is the newest addition to Timex’s E-Instruments™ line. The new E-Altimeter watch features an analog function with an operating range of -400 to 25,000 feet (-120 to 7,600 meters). While other time pieces such as the Expedition WS-4 are digital, the E-Altimeter altitude data is very accurate in both feet and meters. The watch can also recall high and low altitudes within a specific time period. A fourth hand indicates the altitude, pointing to measurements that adorn the watch’s over sized stainless steel case. The E-Altimeter is rugged, and feels heavy, which actually gives you a good sensation of durability and the satisfaction of knowing it won’t break easily if you accidentally hit the watch against some rocks during your outdoor activities. The E-Altimeter operates on proprietary technology developed at the Timex Development Center in Pforzheim, Germany. It uses multiple sensors and an advanced barometric pressure sensor with four-to-six hand movements to provide precise altimeter readings within the traditional analog designs. We found the timepiece to be very accurate, but because it uses pressure to determine the altitude the watch has to be calibrated to a known altitude during its initial set-up. The E-Altimeter also reads in meters and feet, depending on which button you push. The altimeter scale around the watch bezel is the hundreds scale, while the upper retrograde scale on the watch face, features the thousands scale. Pushing the top button on the watch’s right side displays the maximum altitude. The lower button displays the minimum altitude reached during your trip. You can also set the watch to automatically turn off the altimeter after 60 seconds and it can also recall your max and minimum altitudes reached during your trip. Knowing the complex functions and precision necessary to make this watch operate effectively is mind boggling but very cool to look at every time it reads the correct altitude. We tested it against the Expedition WS-4 and found it to be just as accurate. The Timex E-Expedition Altimeter features a maximum and minimum recall function, and reads in both meters and feet. While we didn’t like the fact that the hands did not glow in the dark, the Timex INDIGLO® function works extremely well to see the watch at night. 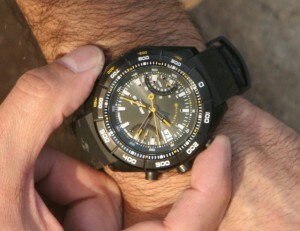 The Timex E-Altimeter watch is available exclusively at Amazon.com and won’t be available in retail stores until May 2010. The E-Altimeter is a perfect watch to show off your outdoor adventure seeking side, while indicating that you have a classy and sophisticated side that looks good on you while sipping champagne at an upscale ski lodge.